Looking for reliable tools to monitor your brand on social media? 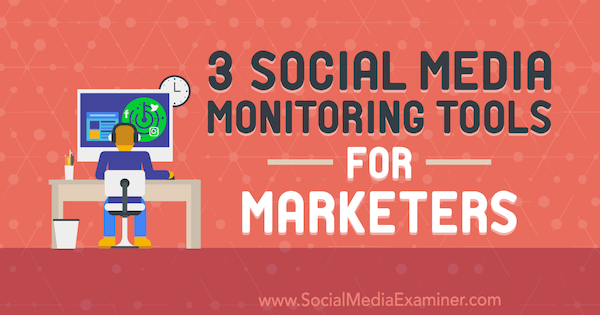 Wonder which social media monitoring tools are best suited to specific tasks? In this article, you’ll discover three social listening tools designed to help you capitalize on influencer marketing, online mentions, and lead generation. For years, we’ve been talking about using social media for lead generation. The good news is that at least one social media monitoring platform got this task right: Awario. It’s a social media monitoring platform that also offers a Leads feature as a free add-on to the reputation management feature set. To start using Awario for social media monitoring and lead generation, go ahead and sign up for a free trial here. You don’t need a credit card to start the 14-day trial. Awario encourages you to use keywords in singular and plural forms to include more possible combinations. Give the tool a few minutes to collect the mentions and organize them into a handy dashboard. Awario includes a solid sentiment analysis feature that allows you to filter your brand mentions for negative, positive, and neutral sentiment. You can use this information to effectively delegate customer relationship-building based on how happy (or unhappy) your customers are. You can also filter your dashboard by potential reach (to identify the most influential mentions), source, and language. If you want to engage with a particular social media user who talks about your brand a lot, search all social media mentions by the author name. From there, click Leads to start connecting with your potential customers and/or promoters. Include your brand name as one word, your brand name as many words, your brand’s official Twitter handle, and the personal brand entities for your company’s public representatives. Promoting your promoters is a fundamental step in any marketing campaign. Don’t start any social media campaign unless you have that process sorted out. Developing relationships with influencers who mention you or your brand on social media is a must. Mention is the social media monitoring platform with the most powerful influencer marketing component. All you need to do is set up your project and it will start tracking influencer interactions with you. For that, create your trial account here. Mention requires no credit card to start your 14-day trial period. To start monitoring, type in your brand name and choose 1-4 competitors (Mention will suggest likely competitors). Give it a day or two for Mention to properly collect your brand mentions. Then click through to the Influencers tab to find which influential social media users are mentioning your brand. These lists will help you reach out to those influencers on a more personal level later on. For instance, you might decide to invite some to your site and employ others as brand ambassadors. My other favorite Mention feature is the Insights Center, which can visualize just about anything Mention is tracking. To generate a visualization, choose any metric (sentiment, source top locations, days of activity, time of activity, influence, topics, etc. ), and select your preferred visualization type (line chart, bar chart, pie chart, tree map, etc.). Mention will then generate pretty visualizations you can download and share with your team, partners, or clients. While every brand mention matters, the mentions that link to your website are probably the most essential ones. After all, linked mentions bring people to your website, and thus directly affect the bottom line by attracting potential customers and generating sales. BrandMentions is a social media monitoring platform with a strong focus on web mentions, especially those that don’t link to your website. To check out the tool, register for a free trial here. Note that unlike the other two tools on the list, this one requires a credit card or a PayPal agreement before you receive access to your account. Once you start your 14-day trial, provide your brand name to monitor. You can use advanced settings to set up your domain, sources, and language, as well as designate terms to exclude from your dashboard. Once set up, the tool takes a few minutes to run and return the initial set of mentions. Right away, your dashboard will contain a separate Unlinked tag, narrowing the list to those mentions that don’t refer to your domain. These tags create a nice organized archive of brand mentions to act on. To sort and filter mentions, BrandMentions uses a “performance score,” which is calculated based on the total number of shares and/or the domain’s influence. You have a variety of options for filtering mentions, such as view only updates that have photos uploaded to them or filter by a keyword. In the image below, I’m filtering my brand name mentions by project name to see tweets and updates that mention both my personal brand and project. You can engage with any mention on social media but these won’t be registered in the platform. Once you click a retweet or a comment button, it will send you to Twitter to engage. Another useful feature is the ability to schedule reports. You can generate a weekly report listing recent mentions, unlinked mentions, top mentions, mention domains, and growth of mentions. The report will be delivered on a set day to a maximum of five email addresses you specify. This is an excellent way to keep your whole team updated. Social media listening is no longer optional these days. It’s a must. What do you think? Which social media monitoring tools work best for you? How are you using them? Let’s discuss in the comments!